Adhesive bandages can be defined as flexible sheet of material or sticking plaster which is sticky on one side and used in medical dressing for small wounds. The backing and bag are made of either plastic or paper. The adhesive sheet can be a latex, plastic or woven fabric strip. The adhesives that used can acrylate including the methacrylate and vinyl resins. Adhesive bandages can be of various types such as specialized bandages, butterfly stiches and transdermal patches. These bandages protect the wound from damage, dirt and friction. Some of these dressings contain antiseptic properties. The global adhesive bandages market is anticipated to witness a moderate growth in terms of revenue over the forecast period. 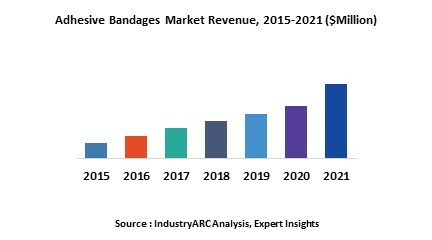 The growing number of recreational events is analyzed to drive the demand for adhesives bandages, thus driving the adhesive bandages market. An adhesive bandage is also used in residential areas. The increasing number of aging population is also analyzed to boost the adhesive bandages market in the near future. The increasing numbers of hospitals have also augmented the demand the adhesive bandages in the recent past. Product launch is analyzed to be the biggest trend in the global adhesive bandages market. The global adhesive bandages market is classified on the basis of product type as follows low-end products, licensed products, specialized and high-end products. The global adhesive bandages market is further bifurcated on the basis of channel into consumer, occupational, and medical market. Medical is analyzed to dominate the global adhesive bandages market throughout the forecast period. Lastly, the global adhesive bandages market is bifurcated by regions into North America, Asia Pacific (APAC), Europe and Rest of the World (RoW). North America is analyzed to dominate the global adhesives bandages market throughout the forecast period. This is mainly attributed to rapid growth in hospital in this region. Europe being mature market is analyzed to witness sluggish growth over the forecast period. Asia Pacific is analyzed to witness highest growth in the global adhesive bandages market over the forecast period. China and India are analyzed to exhibit high growth in the Asia Pacific adhesive bandages market over the forecast period. Middle East and Africa is also anticipated to witness moderate growth in the global adhesive bandages market in the near future. Dynarex Corporation (U.S.) among others.